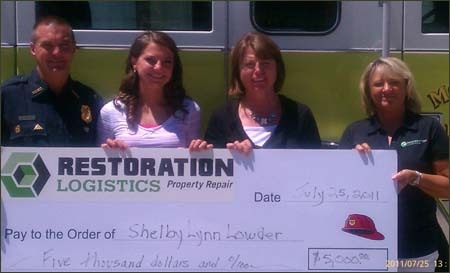 Restoration Logistics made presentations to this year’s scholarship winners at their father’s respective fire houses in late June, 2012. A scholarship was awarded to Jessica Schneider, daughter of Richard and Robin Schneider of Wray, Colorado. Richard is a long time member of the Wray Volunteer Fire Department and a small business owner in Wray. Jessica has been an outstanding student and a very involved young person in her community. She founded a project called Hats for Hope, knitting and crocheting hats for cancer and surgery patients at The Children’s Hospital of Denver. Jessica is an impressive young lady with a heart for giving back. Restoration Logistics is proud to help Jessica with her college career. She is planning to attend Hastings College in Nebraska where she will pursue a degree in the medical field. A scholarship was also awarded to Ms. Jordan Zeiler, daughter of Bob and Brenda Heldenbrand of Holyoke, Colorado. Bob has been a volunteer fire fighter in Colorado for 21 years. Jordan has been a dedicated student and very involved in pursuing a career in nursing as she has already been working as a Certified Nursing Assistant at Memorial Hospital in Holyoke. She is planning to attend Chadron College in Chadron, Nebraska to pursue a nursing degree. The team at Restoration Logistics is excited to help Jordan pursue her college education and a career which gives back to the community. From the beginning in the water damage industry little has changed when it comes to how restoration companies charge their services and in particular, equipment rental. Originally this was done from a lack of knowledge and experience, as the restoration industry was in its infancy stage. The industry has been utilizing what is tantamount to a modified “time & materials” methodology. Times change and this industry has migrated from infancy to adolescent and is moving into maturity. With this change the old ways need to be updated. Much has changed in the water damage restoration business in recent years. Technology, techniques and a breadth of experience have allowed more maturity coupled with an understanding of building science to change how better to serve clients. The old model referred to a list of items and a claim “we will charge you and we promise we will try to be as efficient as possible”. That may or may not have been the case with many restorers, partially due to lack of knowledge, complacency or plain ignorance. As a new model becomes implemented, the burden or shifting of efficiencies should be placed upon the service provider. In this vein we have updated how to better serve the client by shifting the responsibility of efficiency to the restoration company. This is done by no longer charging for equipment rental but applying a unit cost to the structural area affected by water intrusion. This forces the restorer to be as efficient as possible in the drying scheme. The IICRC S500*, Chapter 14, Sections 1.20 and 1.21, have already broken down and provided the basis for these unit cost calculations. We have broken down these units into two specific areas. The first component is air movement or evaporation processes. The second component would be the dehumidification or removal of the moisture from the atmosphere to accommodate a proper drying scenario. With these two components applied to a three-dimensional area we then can begin to get a more complete picture of the costs up front. There may be slight variables such as occupancy of the structure, building component assembly, permanence of materials and saturation of such materials. Generally these are only slight variations as the IICRC S500 has addressed several of these issues in Classifications of Water Damage; see Chapter 11 – Section “Classes of Water” page 196. It may seem like there are quite a few line items, but in fact there are relatively only three components we need to concern ourselves with; air movement, dehumidification and the potential minimum charge. The classes of water have more to do with the volume of water that has entered the structure as laid out the S500 – Standard and Reference Guide for Professional Water Damage Restoration. With these components in place, the client can rest assured that the most efficient methodology possible will be employed when drying a structure. As it stands now there is no verification available to the client to ensure their best interests have been kept in mind. 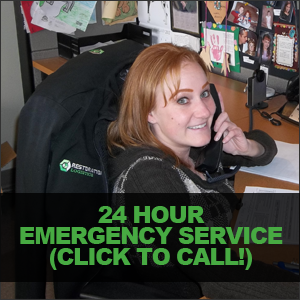 This model shifts the entire burden of efficiency to the restoration services provider which results in efficiencies, time saved and expenses reduced. Restoration Logistics was honored once again to host our annual Charity Golf Tournament to benefit programs at The Children’sHospital of Denver. Participants and hole sponsors have been generous in their giving to help raise nearly $15,000 in donations for The Children’s Hospital Burn Camps Program, The Juvenile Firesetting Evaluation and Treatment Program and The Children’s Hospital Foundation at Restoration Logistics Annual Charity Golf Events. The Children’s Hospital Burn Camps Program provides a powerful, life changing experience for burn-injured youth from around the United States, by addressing psychological and rehabilitation needs of the child and family following a burn injury. 2011 marked the completion of the 28th year for the summer camp program. The program continues to set the standard for specialty camps nationwide by integrating medical staff, professional camp staff, firefighters and graduates of the camp program to ensure a challenging, supportive environment for youth who have survived a burn injury. The Juvenile Firesetting Evaluation and Treatment Program works to prevent burns related to child and adolescent fireplay and firesetting behavior. The program plays an integral role in the identification, evaluation and rehabilitation of juveniles involved with fire from throughout the state and surrounding region. The foundation staff believes deeply that all children should have the opportunity for a bright and healthy future. Support for the hospital can be seen in a variety of ways as community leaders contribute to the mission by giving outright gifts, gifts in kind, volunteering time and energy at fundraising events, corporate partnerships, gifts honoring loved ones, planned giving, and foundation grants. Restoration Logistics is proud to be an annual fundraising partner for The Children’s Hospital. I haven’t talked to you since I started school so I thought it would be great to touch base with you all. I’m just starting the 4th week of school. Thus far I have been extremely busy! There are so many different events and activities happening on campus all the time. I am looking at doing a study abroad program with the ISV organization this summer in which I would do some sort of community service project in either Costa Rica, Ecuador, or the Dominican Republic. I would be there for 4 weeks which would completely submerge me into the culture as well as the language. I am currently waiting to hear back to see if I was accepted into the program and if so, which trip I will be making. I took my Spanish placement test last week and wasn’t able to test out of any credits the first time but, it was recommended that I take the test again now that I know what to expect. So I plan on taking that test again here within the next week. All of my classes are going great. So far my favorite classes are English and Math. They are smaller sized so I feel like I get a little more hands on time with the instructor. My Connections class has come to an end this past week. I’m still waiting for my grades to be finalized but I’m fairly certain that I passed the class with an A.
I recently took my first math quiz and my first civilization humanities test in which I received a high B for both. I have an upcoming chemistry test in which I am rather nervous but, I have already started studying so I’m hoping it won’t be too hard. I haven’t changed my major yet, so I’m still planning on going into nursing with a minor in Spanish. I’m still on a wait list for the CNA program but I hope to start it at the end of November and then complete it by late December or early January. I’m hoping to start the actual nursing program next fall if all goes according to plan. Well that’s all for now. I want to thank you guys again for this amazing scholarship. I am able to be successful because of your team’s generous donation. I hope that my success can make your organization proud! A sunny and clear day of camaraderie among golfers representing emergency response agencies, the insurance industry and the property management field proved to be another successful fundraiser hosted by Restoration Logistics. One hundred twelve golfers joined Restoration Logistics’ staff for our annual charity golf tournament event at The Ranch Country Club in Westminster on August 30th. Many golfers took home prizes from the wide array of donated raffle prizes, including golf and ski gear, wine baskets, dinner certificates and hotel stays. Our winning foursome was David Carter, Michael Janzen, Derrick Whiting and Jake Caramanzana representing American Family Insurance. Restoration Logistics would like to thank our hole sponsors and all who participated for your generous donations to The Children’s Hospital. We will be making a presentation of funds in the next few weeks to the hospital foundation. We hope to see all of you again next year at our charity tournament. If you are interested in receiving a copy of your group photo please email Jamie Bruce at jbruce@restorationlogistics.asquaredwebsites.com. 1. the main kitchen island was a challenge bringing all the electrical, gas and makeup air through the center without having to modify the cabinets and make everything fit…..not sure how you did it, but it was amazing. Plus you were provided the cabinets designed by Lowe’s and myself, and still everything fits. This really was a work of art to make this happen. 2. the wood flooring is spectacular and draws comments from everyone. I’m so pleased that we ended up going with engineered wood rather than solid wood. The kitchen floor preparation was a challenge but turned out great….I remember seeing how flat it was and very impressive. 3. the lower floor cabinet installation turned out exceptional…..we’re really impressed with the soffit work done by you and Roy and it looks great. Julie really likes the island concept (Kevin worked with Lowe’s on this idea) and we’ve seated 5 for dinner. 4. the lower floor tile (happy tile) orientation was really the way to go (thanks to you and Jeri) with all the same diagonal direction rather making transitions between rooms. 5. I’m really impressed with Roy’s carpentry skills………trims, doors, soffits, cabinets, etc etc….he’s really good. 6. I’m really impressed with the way your painter finished the doors and wood trim………..very professional. He really knows what he is doing with oil based priming and staining and sprayed on…..looks very good. 7. Appliance installations turned out very good, with several requiring custom modifications to cabinets, particularly to exhaust ducting. 8. Julie and I are extremely happy with the granite counters…..she just loves her Ivory Coast counters in the lower kitchen. We had those shipped from Houston. 9. I noticed the under-cabinet plumbing and how nice and organized it looks. 10. The major modifications you made for the new lower floor “grandma’s shower” were outstanding. Jim’s ideas were instrumental but your plumbing efforts really make the bath and laundry both a showplace! 11. Plus your client was intent on doing his own major electrical modifications and nearly 70 each new recessed lighting fixtures. This was a major effort, but, if I can say so myself, I think the electrical and lighting turned out very well (except for a couple of recessed lights that had to be relocated). 12. Last but not least, the main floor entry tile (with pinecones) turned out real well, as many people and suppliers had a part in this. If I didn’t know better, I’d think it was professionally designed (maybe my second career?). I remember you and I working at the last minute with the dimensions (provided by our pinecone tile designer) so the wood floor could be installed first. Julie said she and her friend Karen had a big part in supervising this tile installation effort! A big Thank You to you all who made this all happen.